You know a restaurant is serious about their brunch game when they have a separate Saturday and Sunday brunch menu. Located in the Fulton Market area of West Loop, The Publican is modeled after a European Beer Hall. The space features a large U-shaped communal table in the centre of the restaurant. There are also tables scattered throughout the space for non-communal dining as well as some private booths along the walls. The whole set-up with the high-backed chairs made me feel like I was eating in the medieval times! 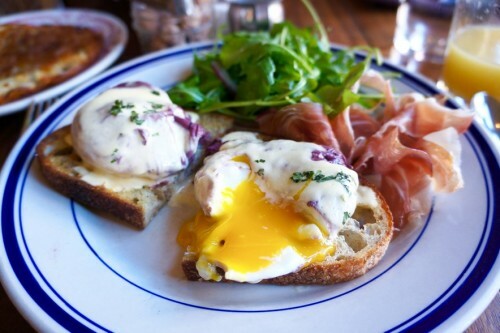 The Publican serves dinner every day and brunch on weekends (Saturdays from 10:00am to 2:00pm and Sundays from 9:00am to 2:00pm). The best part about their brunch service is that they take reservations! But given how large the restaurant is, I’m sure you wouldn’t have to wait long (or at all) if you just walk in. 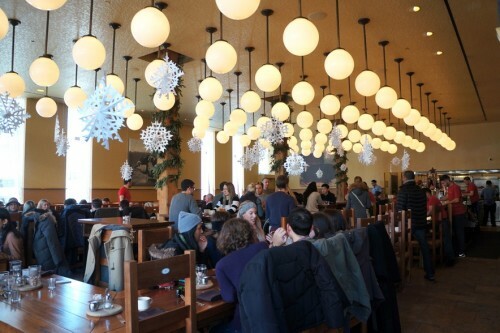 Their brunch offerings actually differ between Saturdays and Sundays so check out the menus before making your choice. We came by on a Sunday which features a wide range of options from a honeycrisp apple salad for something on the lighter side to fried chicken on the heavier side as well as more mainstream brunch fare like French toast. I ordered the Red Wine Poached Eggs – La Quercia prosciutto, sourdough & béarnaise ($13). The eggs were deep purple in colour from being poached in red wine and its flavour was certainly evident in the eggs. 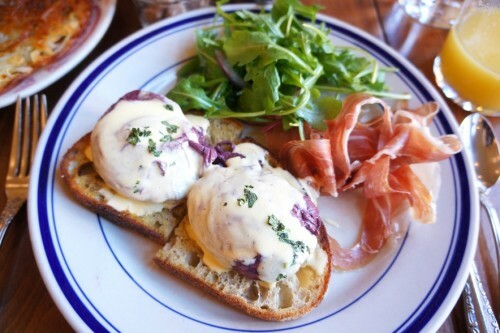 Topped in a delicious béarnaise sauce (similar to hollandaise) and served with a side of thinly-sliced prosciutto and arugula, I thought this was a great take on an eggs benny. 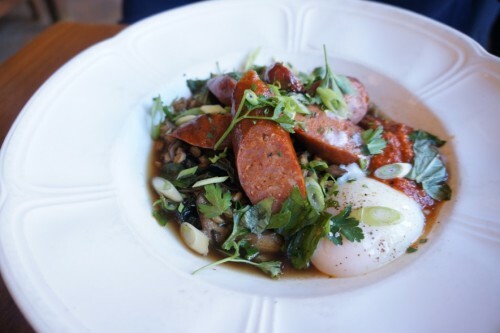 Mike ordered the Italian Sausage – kale, farro, mushroom broth, romesco & soft egg ($15) which really stole the show. I’m a huge fan of farro. It has a similar look and feel to barley but it has a chewier texture which I really love. The whole dish was incredibly comforting with the layers of farro and soft kale in a deep and earthy mushroom broth. The romesco sauce and soft poached egg on top was the icing on the cake. Highly recommended. 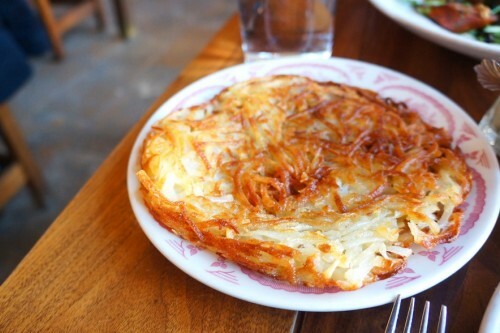 We supplemented our meal with a side order of Hash Browns ($5) which was actually served as one large hash brown. It was perfectly crisp without being too greasy and was the perfect accompaniment to our orders. 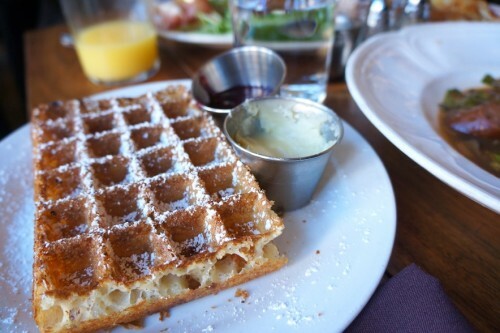 We also ordered the Belgian Waffle – honey butter & cranberry compote ($9). The waffle was super light and airy so it was a nice way to end the meal. But since it was so light, I wouldn’t recommend ordering this as your only dish. It’s not very filling at all. I also found it to be quite pricey at $9 for the single waffle. If you have a hankering for something sweet but more substantial, I’d probably opt for the pecan sticky bun for $4. The food here definitely hit the spot. Next time, dinner at The Publican is on the list!